While AMD is not doing well on the CPU market at the moment, the US company might have an ace in its sleeve – according to online sources AMD has published a new paper, along with the IEEE, that deals with a new high-density computing device concept, which is called Exascale Heterogeneous Processor or simply EHP. EHP packs many features that can be seen in modern GPUs and APUs, if we are talking about AMD processors. 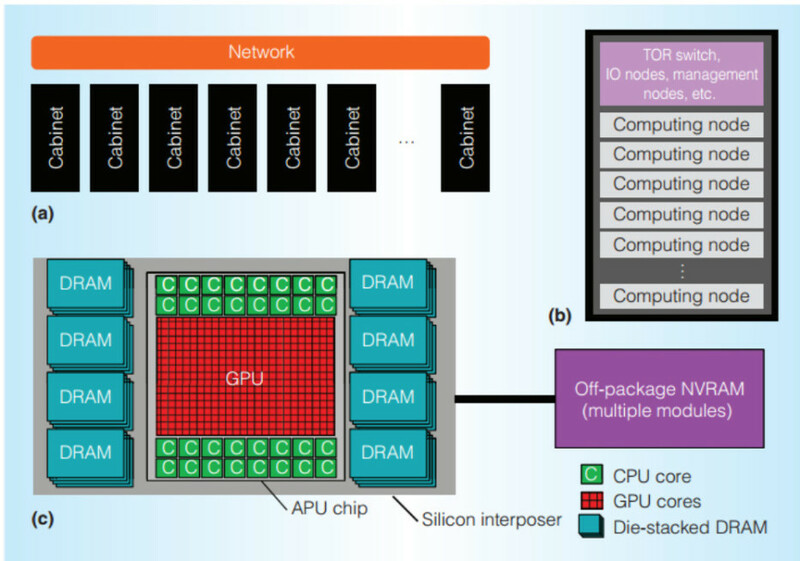 The chip combines a main die that consists of a large number of CPU cores, a large GPGPU unit and an interposer that connects the main die to 32 GB of HBM2 memory that sits inside the same package and is used both as main memory and as memory for the GPGPU unit with no partitioning thanks to the usage of the heterogeneous unified memory access architecture. The CPU component likely consists of 32 Zen cores, which are split into eight quad-core Zen subunits, but unfortunately there’s no information on what’s inside the GPGPU unit. AMD hopes to be able to get a working sample of the new EHP processor by the year 2016-2017 time frame.